Soo… HUGE collection of Pre-Columbian artwork in the Denver Museum… just mind bogglingly massive. Like there was some hoarder of all this stuff who died in Denver and no one knew what to do with it all and they gave it to the museum. 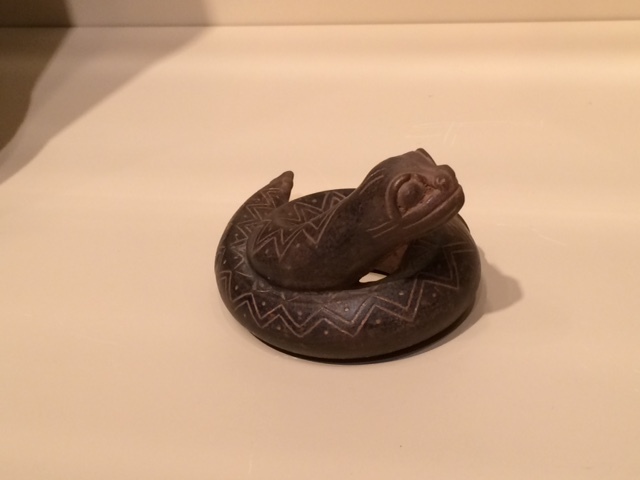 And in the middle of this mass of ancient artifacts is one thing that really caught my eye: this rare snake shaped pot. It’s very small (about 6″ tall and wide) and the opening is on the other side from the picture below. The way it’s designed makes it seem like it had to be hung on a peg… and been impossible to keep clean…anyway. Up close, it is just the cutest little thing ever. But from more than 4 feet away and I feel like someone in Central America, 1,200 years ago, is punking me… because it is JUST like you’re looking at a pile of dog poop in a glass case on the 4th floor of a museum.